Volunteers at the 2018 fundraiser. INDUSTRY - The Giddy Up & Go 4-H Horse Club is joining forces with the recently formed Dusty Boots 4-H Horse Club and is hosting its 12th annual fundraiser for the Double B Equine Rescue this month. The Double B Equine Rescue takes in surrendered, unwanted, neglected and abused horses and other equines from around the state and provides them with food, water, medical and rehabilitative care. They currently have 36 equines and need your help. Donations of any monetary amount and/or hay, grain, shavings, tack and related equipment would be greatly appreciated as they take care of these deserving minis, ponies, donkeys and horses who have been through so much. Members of the Giddy Up & Go and Dusty Boots 4-H Horse Clubs will begin openly collecting donations on February 16th although donations can be made anytime. Donations will be delivered to the Double B Equine Rescue on February 23rd. 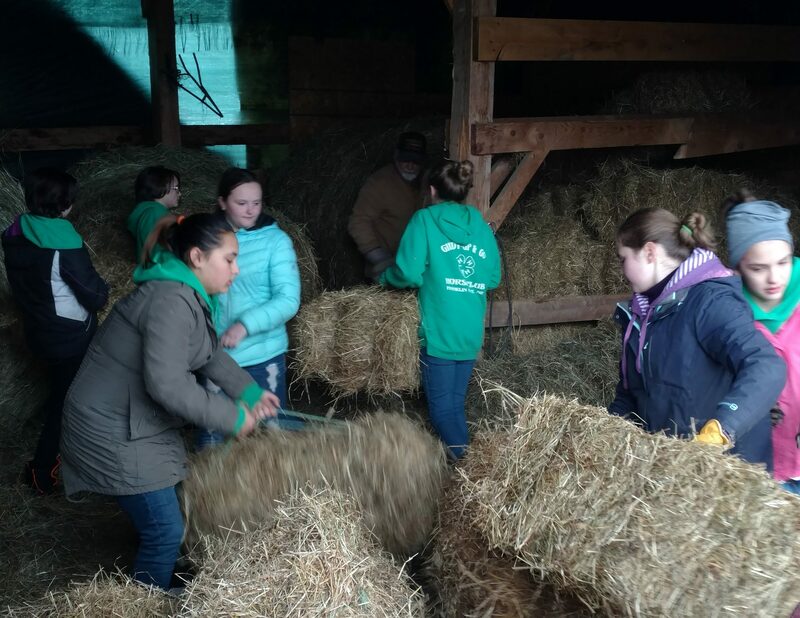 If you would like to make a donation of hay, grain, shavings, tack or equipment please contact a club leader; Donna Crockett at 207-578-2269 or Terri Pierce at 207-779-6774 via call/text. If you would like to make a monetary donation, please send a check made payable to Double B Equine Rescue to the UMaine Cooperative Extension, 138 Pleasant Street Suite #1, Farmington ME 04938. It is OK if donations are received before or after the 23rd. To learn more about Double B Equine Rescue and the horses there, please visit their Facebook page or regular website mainehorserescue.com. Excellent! Giddy-Up & Go members have always gotten great satisfaction from helping Double B the past. With both clubs working on this project this year, the benefit to the equine rescue will be even greater. With hay consumption likely reaching 30 bales a day, this can be a tough time of year. Any donations will be gladly received. The horses need food and vet care just as much as dogs and cats.